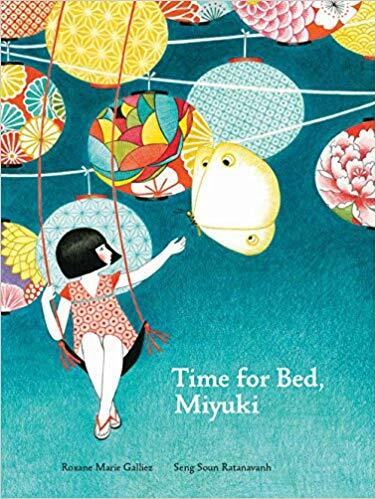 Time for Bed, Miyuki is a gorgeous picture book with vibrant and whimsical creations wandering across the page. Miyuki is reluctant to go to bed, so she presents her grandfather with all the reasons that she cannot go to bed. One at a time, each excuse is patiently, gently, and lovingly considered and dealt with. As ants crawl across the page and a frog peeks from a wooden pail, Miyuki and her grandfather construct a canopy for the Dragonfly Queen and her court, water her vegetable garden, gather a snail family, cover the cat, dance the last dance of the day, and complete her bedtime ablutions. Yet another bedtime ritual must occur before Miyuki can find it in herself rest, but her grandfather patiently performs his role. This story is sweetly told, and everyone understands that grandparents give in to requests quite a bit more easily than parents do, but perhaps there’s more to the story than that. But then again, children (and grandparents) can be incredibly creative when it comes to reasons for not climbing into bed and surrendering to sleep. Time for Bed, Miyuki reads like a poem flowing from page to page. The amazingly detailed watercolor and colored pencil drawings include classic Japanese symbols and items from carp kites to bento boxes, intricate patterns, and bright, vibrant color schemes. Miyuki and her grandfather wear typical Japanese outfits in bright patterns. Adding to the story is the whimsy of scale as they ride kites, sport wings and dance atop mushrooms and gigantic vegetables. While Miyuki may bathe in what looks like a realistic bathroom with the exception of a cloud or two, her grandfather tucks her into a bed that’s a shoe resting on a tree stump in a room carpeted with mushrooms and lit by delicately bent stems of lilies of the valley. If I natter on about the illustrations, it’s only because I wish you could hold this book in your hands and admire the artwork yourself before deciding whether to buy it. That is the disadvantage of online stores, that we cannot leaf through the entire picture book as we would usually do in a brick-and-mortar store, and See Inside is not always sufficient to give us a true look at the book. Picture books are one of my weaknesses and this one is simply amazing. Each picture has so many details to explore and to discuss. It’s just way too much fun as a story, as art, and as a window into Japanese culture. Highly recommended for those who love childish endeavors, picture books, whimsical artwork, and children’s books. This is a story you can return to again and again. Like children everywhere, Miyuki’s imagination peaks at bedtime, when she remembers all the things she has to do before she can possibly go to bed: she needs to water the vegetables, gather snails, and prepare for the arrival of the Dragonfly Queen. Her patient grandfather follows along on her adventures, gently encouraging her to go to sleep. In this beautiful story about family, nature, and love, young children and their parents find a welcome companion for their own bedtime journey.